Passed over were British heavy metal legends JUDAS PRIEST, who have been eligible since 1999 but were only nominated for the first time this year. The 33rd annual Rock And Roll Hall Of Fame induction ceremony will be held at Cleveland's Public Hall on April 14, 2018. An edited version will air later on HBO and there will be a radio broadcast on SiriusXM. Ticket details will be announced in the near future. "It's a Christmas miracle," BON JOVI keyboardist David Bryan told Rolling Stone on Wednesday. "[We were] guys living the dream, getting on a bus with no guarantees in any way shape or form or anything. It was, 'Let's go out and make this happen.' And we actually did." 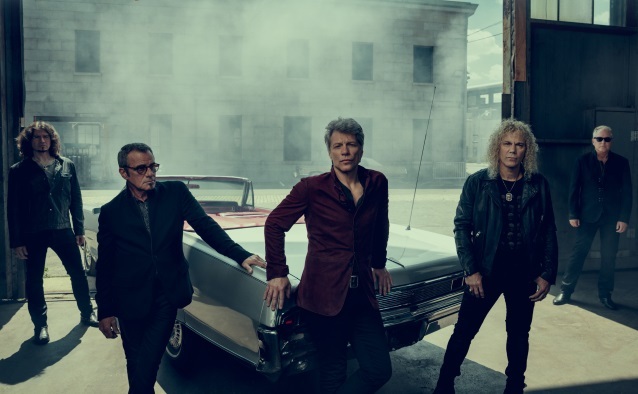 The induction ceremony this year will feature a BON JOVI reunion: guitarist Richie Sambora left the group in 2013 under less-than-amicable circumstances. Jon Bon Jovi later told "Today" that he had moved on, though he insisted that he still had a special place in his heart for his former bandmate. Drummer Tico Torres told Rolling Stone that Sambora and original bassist Alec John Such "are a huge part of us. We'd love it if they played with us." David Bryan agreed. "The idea is that it's a celebration of what we were and what we are," he said. "You'll see the current lineup and then see the original. It should be a fun night." The public was invited to participate again this year in the fan vote, which drummed up record numbers with more than 6.8 million votes cast. (Of those, 1.1 million were for BON JOVI.) The top five artists made up a fan's ballot, which counted as a single vote. "Clearly the enthusiasm of the fans was mirrored by the larger body (of Rock Hall voters)," said Greg Harris, CEO of the Rock And Roll Hall Of Fame And Museum. Overall, "this is a really fantastic group because they span from the 1950s all the way up until today." Despite being eligible for induction since 1999 — 25 years after the release of its first disc — KISS didn't get its first nomination until 2009, and was finally inducted in 2014. DEEP PURPLE was eligible for the Rock Hall since 1993 but didn't get inducted until last year.